Indigenous People – The Highlanders of Ratanakiri. The following are my on-location field notes from December 2015. I travelled with a Krung guide into the forest, he introduced me to the highlanders and translated all interviews. 66% of the people in the furthest northeast of Cambodia, called Ratanakiri, are indigenous people: the main tribes are Brao (Krung), Jarai, Tampun. The “forest people”, also called “highlanders”, “tribal people”, or “minorities” are actually the majority of Ratanakiri, a very rich province. The Khmer Rouge wanted the highlanders to assimilate, they relocated many of them during their rampage years. The Khmer Rouge wanted the tribes to leave their backward system and begin regular field agriculture, to become rice farmers and contribute to society. The indigenous people were also forced to learn and speak Khmer. In the 80ies the local/tribal people moved to the roads and the “city people” moved to the highlands – to do logging, built plantations and do gold and precious stone mining. The land was given away as concessions to people and companies – for exploitation. 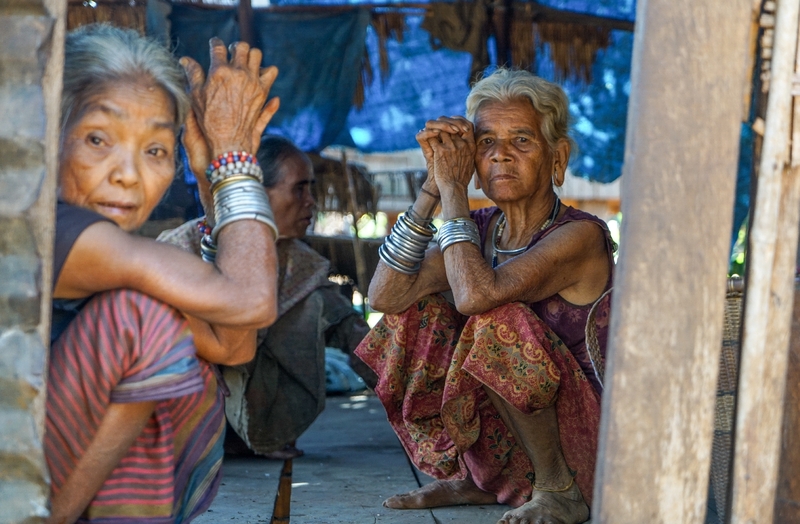 The ethnic minorities were not allowed to use their land anymore – land conflicts started. The tribal people count their age in “rice fields” – every 20 years they move their rice fields with slash and burn practice. If you are 2 rice fields old – you are old. Women take the role of spiritual healers, they speak the language of the spirits and they translate their messages and orders to the villagers. The village people spend half of the year in their “village house” and the other half in their secluded “rice field house”. The village is important for communal rituals and sacrifices. The men go hunting with poisonous bamboo arrows and self-made bows, made from fruit carrying trees. The boys learn hunting when they are 10 years old. Hunters always go hunting with their dogs. They form a close bond with their hunting dogs. Bow makers have a special role in their village, it takes a full week to make bow, the bow is used for a life span. Every time an animal got killed, the hunter takes blood and hair from the animal and rubs it on the bow, called Kachok. They use a “100 kind of poison” mixture for hunting. The older men remember to hunt elephants and Tigers with their bows. People preserve their meat and fish by drying in the sun or salting it. Since all the forest are taking away from them, the tribes move more and more inside the jungle. They know as soon as there is road building they have no chance to keep their sacred forests much longer. The tribes value their children – the more children you have the better. They do not know of the concept “bad children/misbehaving children”. Children mean power for them. The young girls when they come into puberty they get their own little hut, so they can have male friends visiting and finally decide on one – and build their own family. The boys also get their boy huts when they start puberty, the parents do not want them in their hut anymore. The girls inherit the “jewelry” from their mothers, the jewelry is made of old aluminum cooking utensils or brass from former ammunition and landmines. Mountain rice is their main staple food, it is a rice which grows “dry” in the mountains and has a special way of cooking, they steam it in baskets over 2 hours – and the women use the rice water to wash their hair. The fire in their kitchen must be burning always – because if you smell fire, you know there are people – and that is a good sign. Matches are the best presents for them. The sculls of the killed and sacrificed animals are kept near the fire, so are the seeds they collect during harvest and keep dry in the kitchen. Next year’s harvest depends on them. Women oversee the gathering of greens and flowers and roots from the forest, men do the hunting. While animals are only use for rituals or to make sacrifices. Meat is not a regular staple food. Alcohol and tobacco are the main cause for early death in men and women. They distill the rice and make a very strong Schnapps from it. The tobacco they just dry, roll and smoke it – or they use their typical pipes. People mostly die young at ages 45 to 50. The children start working very early, farming is their main occupation, mostly they do not go to school. In the city of Banlung, the capital of Ratanakiri, the saying goes “you are Krung” which means, you are “stupid as a tribal Krung”. The stigmatization of tribal people lets people hide their identity when they work in Banlung or elsewhere. The main source of information for the tribes is a two-hour local language radio program– most of them have a radio in their village. Tribal people do not travel much, a 5-kilometer radius is a lot for them. There was traditionally no need to venture out further, the forest was giving them everything. The minorities are exploited as cheap labor – or labor without payment. They spend their days digging 12 meters’ shafts into the earth, between the rubber trees and start excavating the hot mud, hoping to find Zirconia or Amethyst stones. The stones they can only sell to the guards of the plantations. One dark stone can earn them 2.5 Dollars and 1 Kilogram will be 15 Dollars. If they do not dig, there is no other source of income for them. Sometimes the new landowners – often Chinese or “city Khmer” – employ them for 3 Dollars a day to help them harvest in the monoculture plantations. The new land owners leased the land for 99 years, 150 Dollar for one hectare – from the government. The Khmer police is guarding the leased land so tribal people cannot use or cross their land anymore. Their employers stole their land, or more accurate, the Cambodian government sold the tribal land to foreign investors and leave the exploitation open to them. Since the rubber prices are down one fifth, it is better to have people dig for stones. The guards are cheating the miners of their money. The guards are mostly Khmer or Chinese/Vietnamese foreigners. The land buyers claim officially, that they want to buy land to build rubber plantations – but they are keen to log the hardwood trees and make a fortune with the wood – the rubber trees are justifying the deforestation and land grabbing. The village elders of the tribes are mostly part of the deal, they agree into selling their communal land, because they feel, if they don’t sell it the government will just steel it without paying. The Cambodian highlander tribes have lost their battle – even though there are Highlander Associations and diverse NGOs trying to do their best. The highlanders say: “first comes the road, then goes the trees” – and if the trees go their time has come as well. The forests were always sacred to the tribes. They only took from the forest, if they sacrificed something or they asked the forest spirits for permission. It is still called the “sacred forest” in their language. They build signs for the rice spirits at their fields, the build self-made little straw arrangements outside their doors – to honor the spirits. The sacrifices the people make are mostly small animals. The Krung people have in their village a Banana Tree. That tree is sacred because the banana spirit or God has its home there. If the banana tree is not looking well, then the village is in trouble. The banana tree is mostly situated in the middle of each Krung village and adorned with flowers and offerings. If you need good luck, you meet the banana tree spirit. Tampun people have a special graveyard in the forest. They build huge individual grave structures with carved wooden guards in front of them. Their grave sculptures are made roughly. The dead body gets to rest in the forest, the grave house will fall apart and no one comes to visit after the burying ceremony. The dead are dead and they have their own spirit home where no living being can / should enter. I needed specially permission by the spirits to take photographs. An elderly Tampun person asked for permission for my entry. The wooden grave guards are always male and female, the female is always pregnant and the male guard is a warrior. The burying ritual asks for raw buffalo meet and lots of schnapps. The relatives bring all the belongings of the deceased – it will be buried together with the person. Sometimes it is a lot, sometime nothing. Children’s graves are very small since children don’t own anything. When a woman gives birth to a baby, no one is there to look for her or to help. She gets a different little hut in the village, so she can live alone, no one comes and visits her – to protect her and the baby against evil spirts. For the women, this very hard and they say so. Women start to bear children soon after they start their first period, they bear as much children as possible. The more children the better – family planning is unknown. The mothers name is carried to the next generation – not the fathers. This way people try to prevent inbreeding. 6 days after the baby is born people can come to visit mother and child, if the baby survived the first 6 days it will be given a name. The missionaries from everywhere flock to the tribal villages, build churches and distribute bibles in tribal language – but in Khmer letters. The ethnic minorities do not have a written language, so Khmer letters are used to write down the local language. While a lot of the traditions are still intact, the people are threatened by many different forces. The tribal people do not know their value to society they just feel left behind and backwards. NGOs tried to teach them a different, modern way of living, the new landowners force them into paid labor, the local Khmer people stigmatize them as stupid, missionaries want to teach them morals.